One of the latest football games is now available for download in the Windows Phone Store. 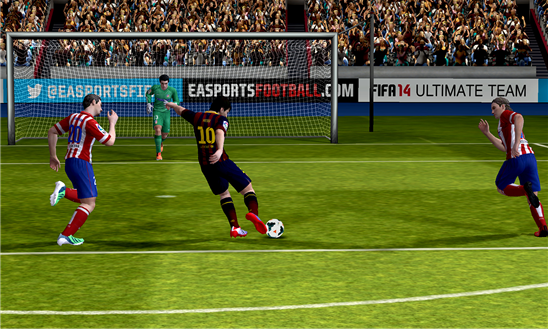 FIFA 14, was available on Android and iOS devices since a long time, and is now available for Windows devices as well. FIFA 2014 on Windows store free of cost, with EA hoping to bring in revenue by way of in-app purchases, which includes Ultimate Team points or even for the unlocking of additional game modes. The game not only includes currency that lets you spend cash to save time, but there are three modes (Manager, Tournament, and Kick Off) that are only available after a paid upgrade. FIFA 2014 features 33 leagues, more than 600 licensed teams and more than 16,000 players, from the English Premier League and La Liga to the German Bundesliga and more. You can even listen to commentary in English, French, German, Italian and Spanish.